Michael comes from a future time when games don’t exist anymore. In his time, a mysterious global event caused every single type of game to disappear off the face of the earth. Desperate to bring games back, genius inventors designed a Time-travel Katana which Michael used to slice through time and travel into the past. Michael has come to our present time to learn about gamification in Gametize and prevent his game-less future from ever happening. Michael first time-traveled to Ancient Greece, where he learnt their language while training alongside Spartan warriors. 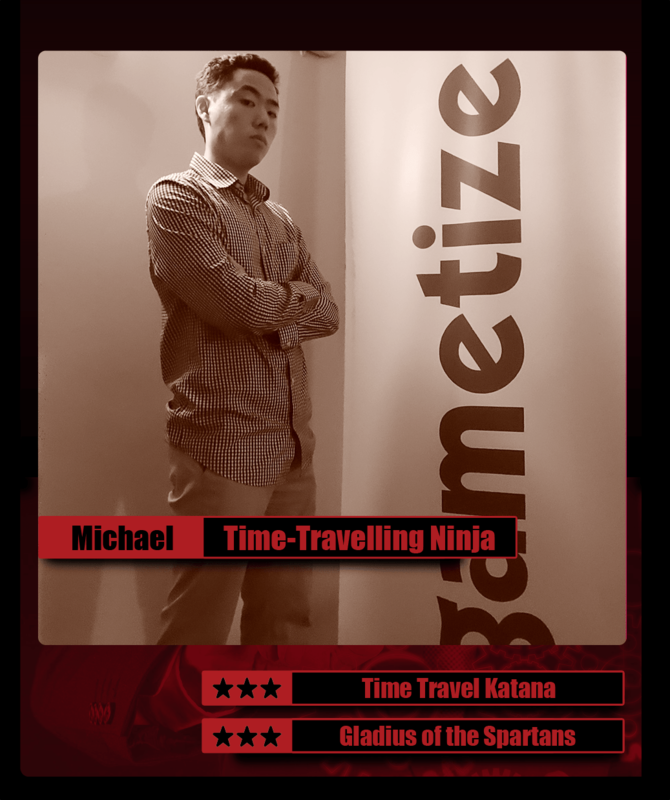 Upon gaining the skills of a Spartan, Michael time-traveled to the present and joined Gametize to study the unique characteristics of games so he can stop a future without games from occurring. To fully understand what makes games so special, Michael is corresponding with Gametize’s consulting partners in the USA and using the Gametize platform to create a game that helps people learn Ancient Greek. He is currently studying Economics at Hillsdale College in Michigan, USA.